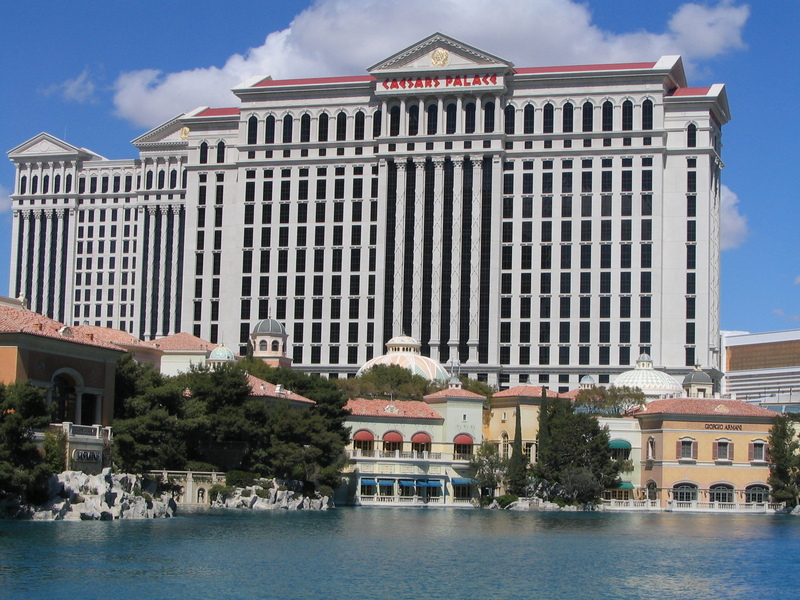 The buildings of the ancient world have had a significant influence on architecture over the centuries. 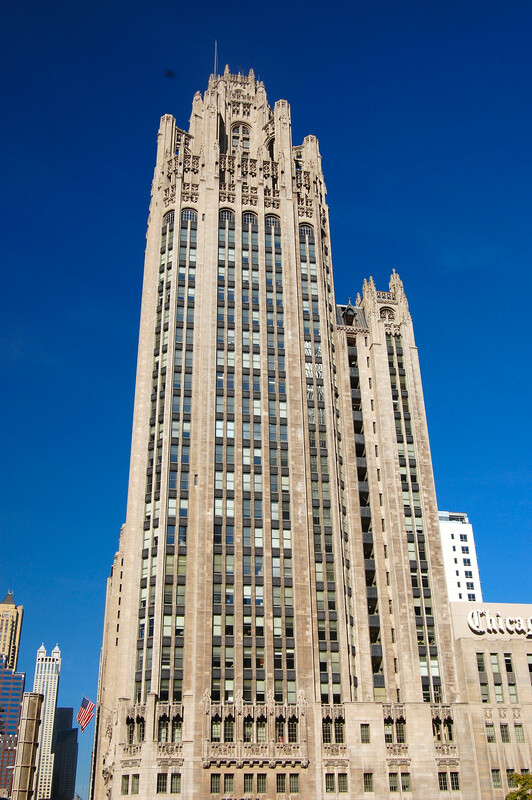 One of the most significant events in the history of modern architecture was the Tribune Tower international competition in 1922 when the Chicago Tribune, the city ‘s oldest and most important newspaper, offered a $50,000 prize for the winning design. 260 (some sources say 263) entries were submitted, including not only the more modern second – place entry by Eliel Saarinen and designs by Gropius and Holabird and Roch but also some outrageous designs — Adolf Loos ‘s apparently serious Doric-column- as- skyscraper and another entry –a tower topped with the head of an American Indian. 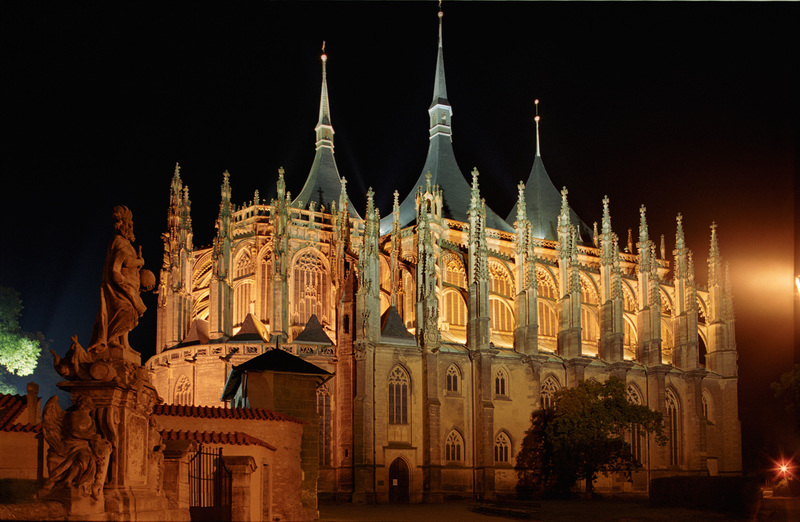 Kutná Hora developed as a result of the exploitation of the silver mines. In the 14 it became a royal city endowed with monuments that symbolized its prosperity. The Church of St Barbara, a jewel of the late Gothic period, and the Cathedral of Our Lady at Sedlec, which was restored in line with the Baroque taste of the early 18, were to influence the architecture of central Europe. These masterpieces today form part of a well – preserved medieval urban fabric with some particularly fine private dwellings. This church is first mentioned in writing in 1279 and is today the cathedral of Stockholm. 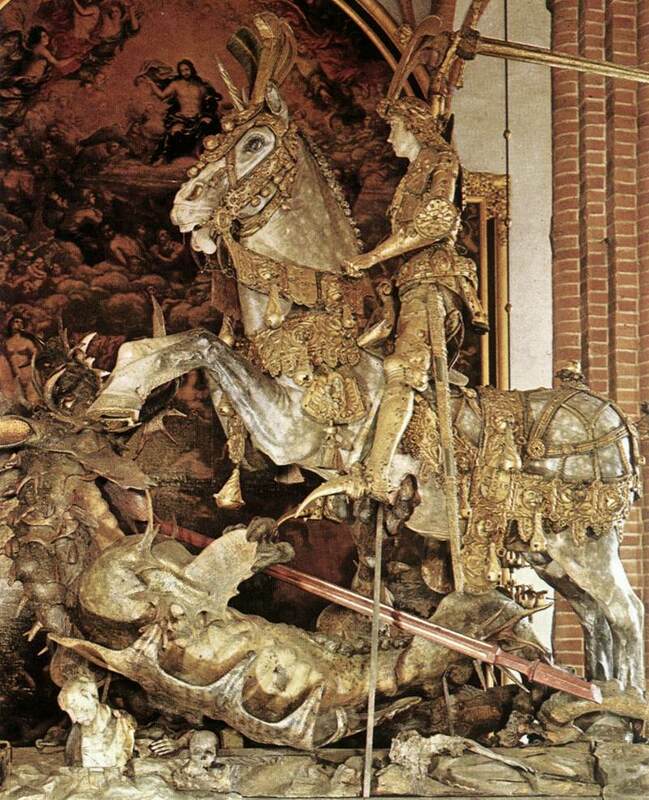 The interior holds many unique artefacts; the most famous is the statue of S:t George and the Dragon made in wood by Bernt Notke in 1489. 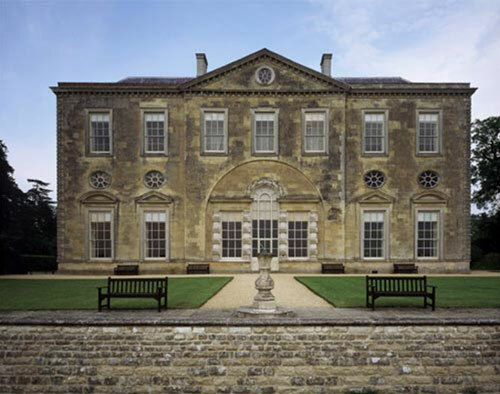 One of England’s most extraordinary houses displaying some of the most remarkable 18th-century rococo and chinoiserie decoration. Features of the house include the unique Chinese Room and parquetry Grand Stairs. In continuous occupation by the Verney family for over 380 years, the house has mementoes of their relation Florence Nightingale, who was a regular visitor. 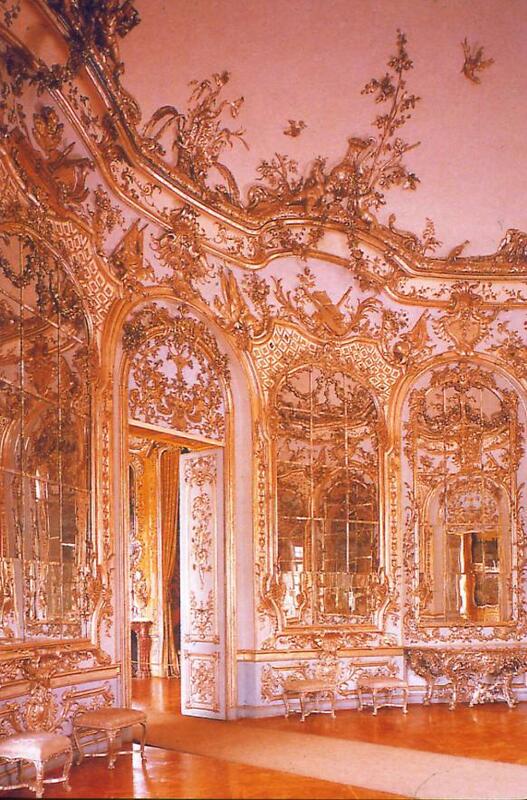 Park of the Nymphenburg, Baroque and Rococo style. The Electress of Bavaria had the pavilion built by Francois Cuvillies on 1734-39, in the park of the summer residence outside Munich. 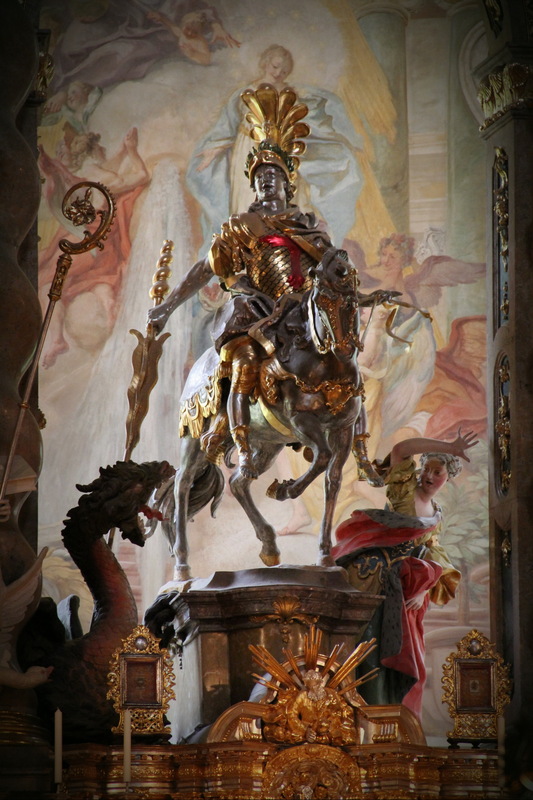 This statue of St.George slaying the Dragon is in the church at Weltenberg. Weltenburg is a Monastery. Joshua Reynolds and Augustus Keppel were lifelong friends from 1749, when Keppel took the young artist to the Mediterranean in his ship the Centurion. This enabled Reynolds to visit Italy and to see the classical and renaissance art which were to influence his painting. On his return to England Reynolds painted this grand full – length portrait of his friend, one of the most important portraits of the early part of his career, and one which established his reputation. Keppel ‘s pose is based on that of a piece of sculpture well known in England at the time. There are four portraits of Keppel by Reynolds in the Museum ‘s collection. On the sides of the Temple were two paved ways that finish with stairways that surpass the height of the exterior. Both lead to two entrances, one with three arches and the other with one, the so- called Arch of Pantani. After the death of Augustus, two monumental arches were added at the bottom of the stairways, dedicated to Germania and Druso Minor…. Calumny, A false statement maliciously made to injure another ‘s reputation. 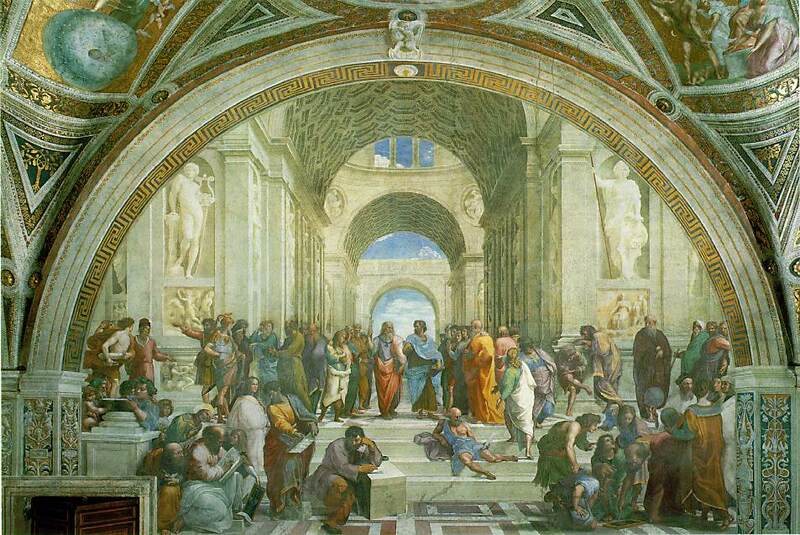 Italy was indisputably the cradle of Renaissance civilization, and Sandro Botticelli was one of her greatest artists. During the early part of his long career he was a painter of religious frescoes; in the mid – 1480 s he attempted a new concept in the painting of women, personifying the Goddess of Love and the Seasons, and it is for this that he is most famous; but at the end of his life he was influenced by the teachings of the reforming friar Savonarola, who denounced the corruption of society. 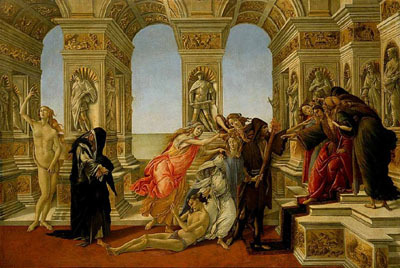 Henceforward Botticelli abandoned the feminine beauties of his earlier work; his imagination became darker and more anguished, as we can see from his allegory of the Calumny of Apelles, one of his masterpieces. Calumny, preceded by Jealousy, drags an innocent man to the judgment throne of Midas; Suspicion and Deceit whisper in Midas ‘s ear, while Remorse gazes downcast at naked Truth. How distant these impassioned mortals are from Botticelli ‘s legendary gods basking in the sun. This is the best short example of director Ragghianti ‘s pioneering ` crito – film.’ All aspects of the film work like an in- depth criticism of Botticelli ‘s painting. North of the Parthenon is the second large temple on the Acropolis, the Erectheion, which is somewhat later. Its construction started in 421 BC, was halted for the Sicilian Campaign and was completed in 405 BC. Its architect is unknown even though many have maintained it was Mnisikles. From an inscription of 409 / 408 BC we know the name of Philoklis as the architect who supervised the works at this stage. 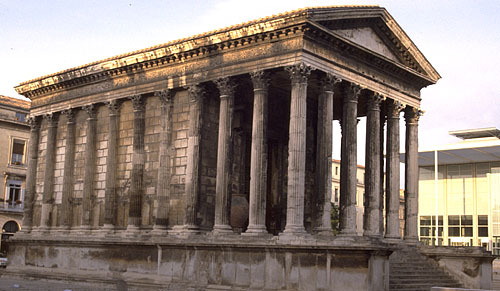 Erectheion is a complex and completely original structure. Its name shows it to be the dwelling of Erectheos and it corresponds to a complex temple building. 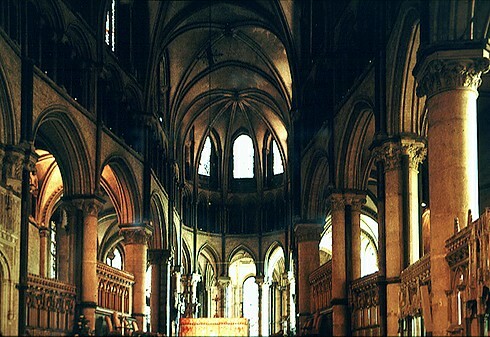 Its architectural peculiarities were the result of the endeavor to leave certain points with religious meaning untouched as well as the as the endeavor to have a variety of uncommon forms of worship coexisting in the building at one and the same time. It was pillared building with six columns on the facade. Internally divided by a transverse wall into two parts which do not communicate with each other. The two sections of the shrine had a difference of three meters in height and did not communicate with each other. 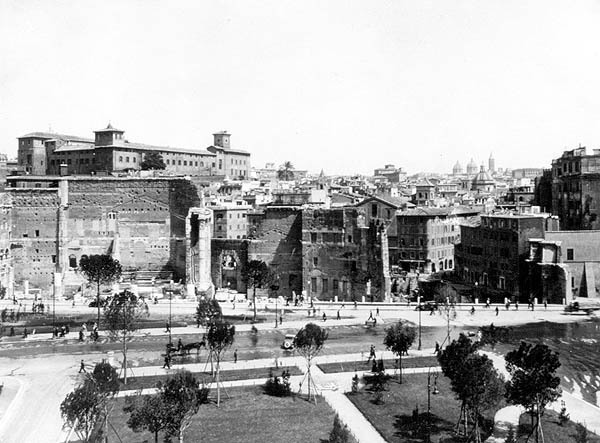 The west side of the building was not enclosed by a wall but had five openings separated by railings with four intermediary Ionic columns which during the Roman period were converted into windows. To the south was the Porch of the Caryatids which was built on the tomb of Kekrops, with six Kores statues which rest on the high continuous base and gracefully support the entablature, and the marble roof. Five of the statues, which today have been replaced by plaster casts, are found in the Acropolis Museum and one in the British Museum…. In his seminal book Il Senso della Morte e L’ Amore della Vita nel Rinascimento, historian Alberto Tenenti wrote that Renaissance signori (seigneurs) saw artistic patronage as a way to ensure their immortality. Nowhere does this emerge with more clarity than in the Pisanello: Painter to the Renaissance Court exhibition that takes place from October 24 to January 13, 2002 at the National Gallery’s Sainsbury Wing. Although his work has been neglected for centuries, Pisanello was one of the greatest artists of his time, famed for his paintings as much as for the medals which portrayed the rulers of his era. Dornauszieher(Hirt, der sich einen Dorn auszieht) in Antikenmuseum, Berlin.